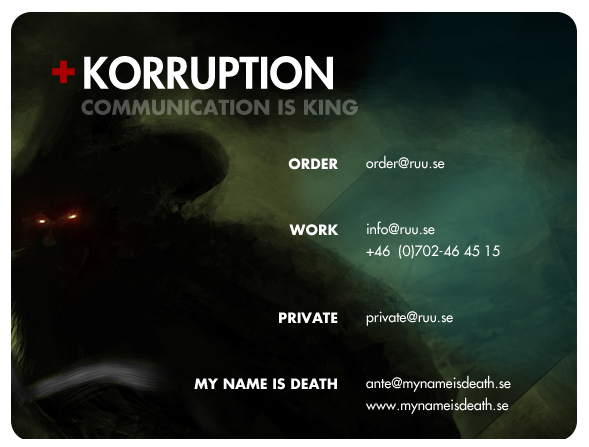 +KORRUPTION is in other words ANDREAS RUU (32) Swedish boy, graphics designer, illustrator, musician, and soon to be father. I mostly work with darker settings and feel most at home in the alternative. I illustrate with a wacom, make websites, design in flash, illustrator and photoshop. My insights includes, but is not limited to; Illustration - Layout - Ad design - Photography - Website Design - Joomla 1.0-1.5 - Flash CS4 - Photoshop CS4 - Illustrator CS4 - InDesign CS4- Sony vegas - Spotify. I sell my art on this site but also do work on comission. If you feel my style of design and illustration would work for your project, don't hesitate to contact me for more information.